You think you know the story of David and Goliath? 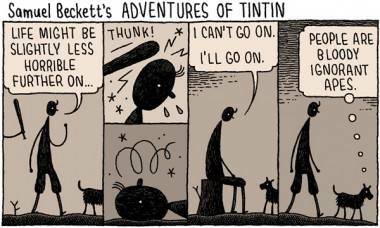 Tom Gauld has news for you – you don’t know the story. Goliath (Drawn & Quarterly, hardcover, $19.95 Cdn), Scottish cartoonist Gauld’s new graphic novel, is largely wordless, almost minimalist, with grainy images and expert (some might even say “Scottish”) comic pacing. 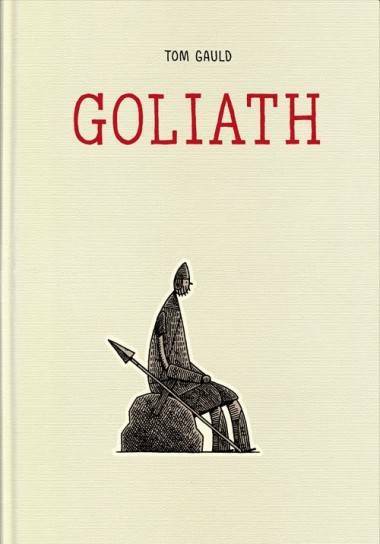 In Gauld’s retelling, or deconstructing, of the story, Goliath is a giant but a gentle one who is more comfortable on the “admin” side of things. The captain of the Philistine army comes up with a plan that is designed to strike fear into the hearts of the Israeli army, poised for war on the other side of the valley. Before that, though, there are a couple of foreshadowing scenes. The one I especially liked was just two panels showing, chained to the hillside, a bear. The bear – the look on its face, its position in the panel, and its seeming arbitrary presence – is one of the early signs that Gauld is in complete control of the story. And we all know how that turns out. Gauld’s purpose is to show us that history may be written by the winners but we often fill in the gaps. The Goliath of this sure, lovely book is not the fearsome combatant most if not all of us have in our minds but a guy who is in the wrong place at the wrong time, with the wrong physiognomy. As mentioned, Goliath is minimalist in art and story; Gauld pares down the dialogue to bare essentials, and lets his stick- figure-like people, minimalist backdrops and precision timing do most of the work. 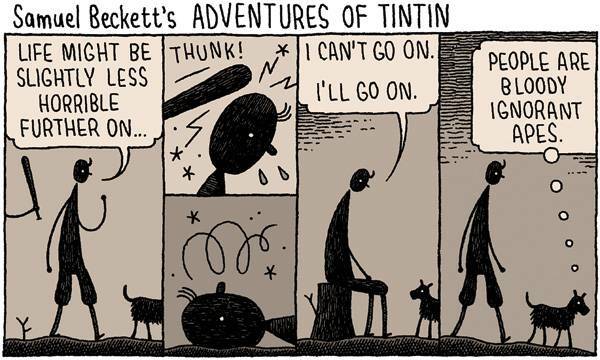 Some might see Edward Gorey‘s influence in the art; I see more of Chester Brown‘s, along with Norwegian cartoonist Jason and (in writing and pacing) a dash of Samuel Beckett. Gauld makes it look effortless, but I would imagine it’s taken him some time and practice to develop into the sure-handed artist he is in Goliath (as well as in his strips for the Guardian and the New York Times). Goliath is deceptively simple; there are layers to the story that will have you thinking about it for days. Readers will take away different things from it; for this reviewer, I can’t stop thinking about the bear. This entry was posted in Features, reviews, the latest and tagged comics, reviews. Bookmark the permalink.